Like many Christians, I grew up in churches that believed and taught that most people would spend the rest of eternity burning in flames. A place of eternal consciousness where every moment was occupied with unimaginable tortures; some said that there were demons in hell who were skinning humans alive or forcing sulfur down peoples throats and prodding them with hot irons. Still others said that the people were engulfed in flames and trapped inside deep dark pits; in all the various scenarios the wounds would heal and the suffering would never cease. Some churches believed that Satan and the demons had no authority in hell and that they would be burning along with the rest of fallen humanity with God and His angels substituted in to fulfill the role of tormentors. Ultimately though the story was the same, heaven was the promise and hell was the sales pitch strategy for those wishing to avoid such a fate. Church was the contractual obligation to be fulfilled and the sinners’ prayer was the signature on the dotted line. While there can be no doubt that there are very bad and eternal consequences for rejecting the life that Christ offers us. As a Bible believing Christian I no longer find anything in the opening paragraph that holds true when I look for it in scripture. So if you are tormented by the idea of loved ones suffering an eternal scenario like the one mentioned above, if you have come to reject or loathe a god capable of such atrocities or if you are simply willing to let the idea of eternal torment in hell be examined and put to the test then read on as below I offer ten reasons as to why I no longer hold to this view. 1 - The underwhelming support for it found in scripture. While the imagery that I opened with is common in other writings such as the Quran, there is little support for it to be found within the pages of the Bible. Most of the verses we think of when we think about hell actually contain no mention of duration of punishment at all. Whether it is the rich young ruler, the weeping and gnashing of teeth verses or the place where worms feast on the corpses of God’s enemies, any ideas of eternal consciousness that we hold to we have imputed on to the texts ourselves. When it comes down to it, there are only three verses in the entire Bible that could imply eternal conscious torment (hereafter referred to as ECT) which are Matthew 25:46, Revelation 14:11 and Revelation 20:10. It’s important to note here that these three verses when taken in isolation appear to contradict the vast majority of other verses in the Bible (see point 4) and so it is wise to consider the language more carefully. The two verses in Revelation for example are likely drawing from the imagery found in other places of the Bible such as Ezekiel 38-39 and Isaiah 34. In Isaiah 34:9-10 for instance, we see that the destruction of the Edomites is described with the imagery of sulfur and fires that would not be quenched and where the smoke ascends forever. Obviously the language here is meant to convey the severity and finality of the destruction rather than to be taken literally. We see something similar in Jude 7 as well which says that Sodom and Gomorrah suffered the vengeance of eternal fire. Sodom, Gomorrah and Edom are clearly not still literally ablaze so we should concede at the very least that the language of Revelation might just have been intended to be taken likewise. As for Matthew 25:46, the eternal punishment mentioned in that verse is contrasted with eternal life. Surely then it makes more sense to understand eternal punishment as something contrary to eternal life? Something perhaps along the lines of the irrevocable loss of life, being dead forever or as eternal destruction (2 Thessalonians 1:9). If I am wrong though and those three scriptures do support eternal conscious punishment, one has to wonder why God would have remained silent about it throughout the Old Testament and the rest of earth’s history? Why is something so prevalent in the modern church reduced to so few mentions in the last portion of the Bible? It does not make sense. If ECT in hell is true, then the language used to describe the fate of those who reject God in scripture becomes confusing. The Bible speaks of those who will perish (John 3:16) but ECT says that they will never perish. The Bible speaks of those who will be destroyed (Matthew 10:28) or suffer everlasting destruction (Matthew 7:13-14, 2 Thessalonians 1:9), ECT says that they will never be destroyed for they are indestructible. The Bible says that those who did not follow Christ will be burned up or consumed (Matthew 3:12, Hebrews 10:27), that they will be ash (Malachi 4:1 – 3), they will waste away (Psalm 112:10), they will be no more (Ezekiel 26:19 – 21), they will melt like wax before a fire (Psalm 68:2), they will fade away (Psalm 37:1-2), they will disappear (Isaiah 1:31), they will wither (John 12:25) and that they will not live forever (Genesis 3:3). To play with the literal meanings of any of these phrases is to deny them completely, either you will disappear or you won’t, you will perish or you won’t, you will live forever or you won’t etc. I find there to be a deep irony in the fact that in order to defend ECT, one needs to take Revelation (a book full of wild imagery) literally and the rest of the Bible to be speaking figuratively. Scripture speaks of a second death (Jude 8, Revelation 21:8), the standard answer to this is similar to the previous point. For those who teach the mainline view of hell death no longer means a loss of life but rather a separation from the omnipresent God. But if death refers not to dying but to simply being separated from God, then what does it mean when the Bible also says that one day there will be no more death (Revelation 21:4)? Or what happens when the last enemy (death) to be destroyed is conquered (1 Corinthians 15:26)? Will those spending eternity consciously being tormented in hell no longer be separated from God? What happens when separation is destroyed? By that definition death sounds more like Universalism to me than it does our modern, traditional view. Contrary to the doctrine of ECT, I find an abundance of support for the idea that people are not inherently immortal and that only those who are in Christ will receive the gift of eternal life. There are literally hundreds of verses supporting this, rather than add them here I have made a list of supporting scriptures which I am always adding to that you can look at and study by clicking over here. Simply put, though, I find the verses in the link to overwhelmingly, convincingly and consistently support the idea that whoever believes in the Son has eternal life, but whoever rejects the Son will not see life (John 3:36). Even in the Old Testament where God sometimes seems to be more angry and willing to dish out punishment, we see a limit on what is to be meted out. Consider Deuteronomy 25:1-3 where it speaks of a guilty man found deserving of a beating, a condemned man was permitted to be beaten with the number of stripes in proportion to his offense and never beyond the number forty. If the punishment is to fit the crime then how does a life of 20, 40, 60 or even 80 years yield an infinite number of stripes? Some have said that to sin against an eternal God is deserving of infinite punishment but does that not assume that the two words mean exactly the same thing? And if justice is to be carried out in the form of unending punishment does that not mean that God’s justice is never actually satisfied or realized? 6 – What would be the purpose? Throughout scripture we see God’s restorative justice in action. That is to say that there is a purpose to His judgments. In extreme cases the wicked are wiped out by natural disasters or enemy groups usually with a remnant remaining behind. In less extreme cases people are rebuked or something bad will happen in order to provoke them toward repentance. The point though is that ECT seems to have no restorative purpose at all. The lost are forever fixed in their state and mercilessly kept alive to endure excruciating pain forever. They would simply continue to curse and be cursed. So the LORD of Hosts says that true justice is to show mercy and compassion. The retributive (and then some) form of justice that ECT entails could not be more contrary to this way of thinking. No one can deny that for the last 1500 years the idea of eternal conscious torment has been the dominant view of both the Catholic and the Protestant churches. Importantly though, conditional immortality and even universalism were both well represented before the time of Augustine along with the idea of ECT. Now if I heard a doctrine preached and there was no evidence that early church held to it, I would be especially concerned and suspicious of it. But the ideas that I shared in point 4 are consistent with what was taught and can be found in the writings of men such as Clement of Rome, Ignatius of Antioch, Justin Martyr, Irenaeus and Arnobius. On the contrary, ECT’s history seems to extend beyond the Bible and early churches teachings; seemingly having infiltrated the church through a Hellenistic influence and the philosophy of Plato in particular. The Bible proclaims a glorious future, it speaks of a new heaven and earth where there is no more death or sorrow and of a time where God will be all in all (1 Corinthians 15:28). I like to think of it as a restored version of the Garden of Eden where everything is “very good indeed” and God can be found walking in the cool of the day enjoying His creation and visa versa. But if wickedness remains and has not ‘passed away’ but continues to exist in those suffering unimaginable torments in hell then God is not all in all, He is only all in some and that is not success. For death, sin and rebellion have not passed away but have merely been confined to an underworld prison. Lastly, I do not see Jesus whom scripture reveals to be the exact image of the Father, that is to say, the truest and clearest revelation we have of who God is and what He is like, as someone who would stone an enemy, much less burn them alive. Jeremiah 32:35 speaks of the Israelites who burned their own children as sacrifices to Molech in the Valley of Hinnom (which is called Gehenna in the New Testament and then translated as hell in English). The verse continues on and says that this was an abomination to God that had “never even entered into His mind”. We know that Jesus commanded us to love our enemies and that He even went so far as to allow Himself to be killed by His own, so the idea that He has had a change of heart and has gone from “forgive them for they know not what they do” to “let’s burn them and keep them alive forever” seems odd. In conclusion, the more I have studied this over the years the more I have become convinced that hell, whatever it might actually be, is not a place of eternal conscious torment but more of a symbol of the utter hopelessness that awaits those who reject Christ. Yes, there will be a resurrection of the dead and consequences for rejecting the Gospel but it will most likely look very different to what we have previously imagined. The purpose for resurrecting those outside of Christ only to have them suffer a second death is still a mystery to me but there must be a purpose behind it that I am yet to understand. What I do know though is that if He is our life then rejecting Him is to reject eternal life itself. If you want to explore the idea of conditional immortality further here are some helpful resources containing blogs, podcasts and more. "If the punishment is to fit the crime then how does a life of 20, 40, 60 or even 80 years yield an infinite number of stripes? Some have said that to sin against an eternal God is deserving of infinite punishment but does that not assume that the two words mean exactly the same thing? And if justice is to be carried out in the form of unending punishment does that not mean that God’s justice is never actually satisfied or realized?" Your questions here assume that you know God's standard that humans have violated in order to merit extinction. But God is so Holy that any sin compared to His goodness is worthy of eternal punishment. You debase the holiness of God when you think that even one sin, let alone 80 years of sin, is not worth eternal justice. I appreciate your comment but from my side I just don't see the justification for it in scripture that I can hold to it. I do not claim to know God's standards nor do I have His many qualities that would make me a worthy judge of people. But I think we may believe differently about the holiness of God, if anything the idea that eternal torture is tied to Gods goodness sounds like a dangerous assumption to make. My intention with the quoted statement was simply that each one will receive back in measure according to what he has done, some will be beaten with few stripes and some with many as it says in Luke 22 I think it was? I should also emphasize again that my view does not negate the eternal aspect of the punishment involved, I simply believe that the ultimate punishment is being dead forever rather than forever being destroyed without conclusion. Blessings. J Buhay, that's a very medieval concept of justice. The concept that it isn't the severity of the crime, but to whom the crime was committed against which determines the punishment. It's why hunting in a King's forest could get you a bigger punishment than murdering your fellow peasant. I don't see that as a Biblical view of justice at all. we know God's standard because he communicates them they are not a mystery on principle alone we know that God's desire is not that men should not die but live equally he takes no pleasure I don't even point to the scripture because they are clearly lined out in this article God says what the price is what the penalty is it is death and not eternal damnation. Never is anything in any context eternal except God and so the question is only natural without questioning God to ask if eternal torture and damnation is part of the character of a loving just and merciful God it is not. This does not hinge on God or even sin Hell as a doctrine only serves to empower the church to make men conform to the church as an authority on earth. Again, based on your reading of the text, who do you think has the knowledge and power to determine what "measure" each of us deserves to get for our sin? Who is the one who sin offends most? Your approach to judgment simply looks at sin from our perspective and not God's. If sin is so heinous to God that He would literally rather die than accept it, why do you think it isn't in the realm of possibility that sin, any sin, is also deserving of eternal punishment? Pretty sure endless death is eternal. Why would God, who detests sin so much, keep it going in perpetuity in an eternal torture chamber? Thanks for the links J Bulhay, I'll have a look at them. To answer your question though, Paul says that the wages of sin is death, not eternal conscious torment and I find this interpretation to be consistent with what I see elsewhere in scripture. J Buhay. It is God's standard that the article is supporting, not man's. It was God who gave the standard that the proper punishment for a crime should be in proportion to the severity of the crime. That is, an eye for an eye. As Jonathan Hamilton pointed out, this idea of an eternal punishment for a finite crime is a medieval concept. It originated from Anselm around 1000 A.D. It was based upon a feudal justice system, not a Biblical one. How do you know what is proportional if we can't even fathom the holiness of God? Again, all we have is a glimpse of God's holiness - that He would rather die than accept sin. That tells me that even with the proportionate standard of punishment, God has all the right to punish sin eternally. I also think that people in Hell are still in open rebellion against God and don't want to be in heaven anyway. But it is a very human perspective you speak from when you say that sin only is a finite crime - tell the to Adam and Eve. J Buhay, you say "it is a very human perspective you speak from when you say that sin only is a finite crime"
It's not me that says it, it's God. "An eye for an eye" You seem to be saying that the rule should have been have been "an eternity for an eye". Again, it was God himself who established this rule of proportional punishment, and he applied that to actual sins - like putting someone's eye out. "And the devil who deceived them was thrown into the lake of fire and brimstone, where the beast and the false prophet are also; AND THEY WILL BE TORMENTED DAY AND NIGHT FOREVER AND EVER." Rev 20:10 You are drawing the conclusion that the lake of fire ends existence, when the Bible clearly says otherwise. You need to look at the word "forever." The Old Testament says that circumcision was meant to be "forever/eternal," but Paul argues it's done away Acts 15. "Forever" also means for it's full intended duration -- and not only time without end. If it were not for this passage and perhaps one other in Revelation (See section on Revelation 14:9-11), what is now the traditional view of hell may never have developed. The beast and false prophet are seen thrown into the lake of fire at the onset of the millennium (Rev 19:20) and are still there a thousand years later when the devil joins them and they are tormented forever. After rising from the dead the unsaved are thrown in, joining their fate, and consistency would seem to demand that they, too, are tormented forever. The challenge to conditionalism again seems obvious. Other equally obvious factors, however, often go unnoticed or unmentioned. First, it should be obvious that the vision given to John consists of highly symbolic, apocalyptic imagery and must be interpreted carefully. As discussed above, the imagery of eternal torment may not communicate literal eternal torment any more than a seven-headed, ten-horned beast (Rev 13:1) ridden by a prostitute with the name of a city on her head (Rev 17:3-6) communicates a future reality like something pictured in a horror movie. Secondly, it should be obvious that death and Hades are abstractions, not concrete entities, and are thus incapable of experiencing torment at all. And yet in this image they’re thrown into the same lake of fire as the others after being emptied of their dead (Rev 20:13-14). Most traditionalists acknowledge that this means death and Hades will be no more, yet they nevertheless argue that even though the resurrected lost are not explicitly said to be tormented eternally in the lake of fire their fate must be the same as the others thrown into the fire. But consistency demands that everything thrown into the fire experiences the same fate, so that of the devil, beast, false prophet, and risen wicked should be annihilation in reality, even though some of them are depicted in the imagery as eternally tormented. Thirdly, not only do we have the Old Testament uses of the imagery to rely on (see section on Revelation 14:9-11), but the book of Revelation in many cases interprets the images for us! John’s vision is sometimes interpreted for him (Rev 17:7), and John appears to explain the imagery of the lake of fire itself by calling it "the second death" (Rev 20:14), the same interpretation offered by “he who sits on the throne” (Rev 21:8). So the imagery does not symbolize everlasting suffering but death—a permanent, irreversible death of body and soul (Matthew 10:28). Furthermore, the divine interpreter of imagery, foretelling the same events, explained to Daniel that what the beast experiences in the imagery symbolizes the permanent annihilation of the dominion of the kingdom it represents (Daniel 7:11, 25). Lastly, the symbolic nature of the vision recorded in the book of Revelation is such that it must not be the foundation upon which we build our doctrine of hell, even though it is arguably used in just that fashion by traditionalists. When we allow the divine interpreters of Daniel’s and John’s visions to explain the imagery to us, we can see that it communicates annihilation. The dominion of the kingdom represented by the beast comes to an end. Death and Hades come to an end. The devil and his angels will come to an end. The unsaved will likewise come to an end, a permanent destruction of body and soul. While others have responded with excellent answers already, let me add that as I pointed out in the article, Rev 20:10 uses the same terminology as Isaiah 34:10 which clearly is not meant to be taken literally. When in doubt, let scripture interpret scripture. Peace. It is interesting how things are presented as a debate and not just plain and simply false teaching. Fire and darkness were feared among the jews. It was the most powerful imagery, so therefore, for those who refuse to believe, there is an eternal punishment. Right, and eternal death IS eternal punishment. If that's the case, then we shouldn't have a problem with either interpretation, right? So why insist that eternal conscious punishment is incompatible with the character of a good God? Good stuff brother! I have written an article on this subject too. Feel free to check it out! Thanks Markus, please can you add the link here for us? Wesley, you are in deep error and have been listening to doctrines of demons for too long. The root of the problem here is a deep rebellion against any kind of authority. It comes through in your reasoning throughout the blog. Repent and turn back to the ancient paths before your heart is so hardened that you no longer are able to discern the voice of the Holy Spirit. You have been deceived and now you go on to deceive others. You will be held accountable unless you repent. Shut down this blog and seek council. Ryan, I do not believe that there is anything that I or anyone else could say that could move you so let me just say this. Resorting to name-calling and pronouncing judgments without ever actually engaging with the content of the blog is probably the least persuasive approach you could have taken. Discuss the subject matter and I promise that I would listen, I'm an open minded guy. PS - Congrats on the coming addition to the family. Keep well. Nothing will move me from the literal reading of the Truth of the Word of God. I am not calling you anything other than what the Bible clearly says, judging by your public promotion of false doctrine. The scriptures judge you themselves. I am only repeating what they say. As I will not be moved by your arguments, it appears neither will you by mine (despite your assertions), so discussion is, as you say pointless. I am not trying to persuade you however... I think that you are beyond that point. I am warning others who may be otherwise persuaded by your writing, to remain faithful to the Word of God, and not the vain theories of men. We do actually pray that the HS open your eyes to what is really going on here. Please don't be mistaken, the negativity you have had / are experiencing around your writings is not persecution. You are not a martyr for the new / hidden messages of the Bible. The Lord is giving you an opportunity to reconsider your path and to change it before it's too late. I say this in love - and love can sometimes be tough. Maybe one day you'll thank me. I hope so. This is a debate, provide reference for your position, you have no authority to judge anyone. PS - how can being dead forever be a punishment? It's a relief and a release at the same time. It's illogical. Are you familiar with the term 'Capital Punishment'? Is it a let off for a criminal? And how long are the consequences of this judgment? Does eternal destruction (2 Thess 1:9) mean 'destroyed forever in hell' or 'the gift of eternal life without being destroyed but with lousy accommodation'? To anyone arguing for eternal conscious torment. Please study the list Wesley has made up. 100s of verses in favor of eternal destruction cannot be brushed aside that easily. If God removed Adam and Eve from the garden so they could not eat of the Tree of Life and live forever and "those that do his commandments" have a right to the Tree of Life so they can live forever, then how do the wicked live forever if they are barred from the tree of life? The simplest, most common sense answer is that the wicked don't live forever. This appears to directly contradict Revelation 20:10. Which is correct? I point to Exodus 21:5 as an example of "forever" in scripture. The servant does not serve the master throughout all eternity, but for the rest of his life. Well put! Thanks for adding your voice here. Very good article. The Bible is so clear on this, it's ridiculous to believe in an eternally burning hell. Sodom & Gomorrah were destroyed by "eternal fire" and their smoke "went up forever," but they are not still on fire today, and the flaming brimstone isn't still falling on them. However, the result of that destruction WAS eternal - they are gone forever. Just as we throw wood in the fire to be destroyed, with various types of wood taking longer to burn than others, and are left with a pile of cold ashes from ALL of it that we can walk on "in the same day" when the wood has been totally consumed, that's the fate of the wicked! Mal 4:3 And ye shall tread down the wicked; for they shall be ashes under the soles of your feet in the day that I shall do this, saith the LORD of hosts. One's wages are earned for what he has done. A gift is given but must be accepted and used in order to fully receive and enjoy it. The wages of sin, based on a lack of repentance, is DEATH, once for all (read the rest of Rom. 6), just as Jesus died once for all, but His resurrection by His Father freed Him from the state of being DEAD - NOT ALIVE. Rom_5:21 That as sin hath reigned unto death, even so might grace reign through righteousness unto eternal life by Jesus Christ our Lord. Not once in all of scripture is the term "immortal soul" used. Immortality is only given to the righteous, so death, the complete absence of life, is the punishment of the unrighteous, and that DEATH will last eternally - they shall cease to exist and never again be remembered by the righteous. The ONLY use in the Bible of the word "immortal" is in 1Tim. 1:17 - "Now unto the King eternal, immortal, invisible, the only wise God, be honour and glory for ever and ever. Amen." Even Jesus was not referred to as immortal, because He had to DIE, as the perfect sacrificial Lamb of God, harking back to the ceremonial sacrifice on the Day of Atonement of a lamb without spot or blemish. Eze_18:4 Behold, all souls are mine [God’s]; as the soul of the father, so also the soul of the son is mine: the soul that sinneth, it shall die. Eze_18:20 The soul that sinneth, it shall die. The son shall not bear the iniquity of the father, neither shall the father bear the iniquity of the son: the righteousness of the righteous shall be upon him, and the wickedness of the wicked shall be upon him. So the fires of hell will go out when the wicked and unrighteous have all been destroyed - they are fuel for the fire, and when the fuel is consumed, the fire goes OUT. The smoke of it goes up into the sky until it vanishes, dispersed by the wind. Rev_21:4 And God shall wipe away all tears from their eyes; and there shall be no more death, neither sorrow, nor crying, neither shall there be any more pain: for the former things are passed away. Thanks Susan. It seems so obvious, the hard part is just getting people to listen, if we can do that, I am sure many more would hear. Great job. I believe your conclusions to be accurate and scripturally sound. We readily assume that an innate immortal soul is the natural state of man, but the concept of "bios" would prove otherwise. Adam was provisionally given abundant "zoe" - Greek for eternal life (Gen 2:7 Septuagint), but he sinned and forfeited it (Romans 5:12). It was replaced by bios, temporary life. Like a charged cell phone with no outlet to be found, Adam was unable to recharge at the tree of life and eventually died. This life was passed on to us, we suffer his same fate because we were in him when he sin, he was our representative. By Christ becoming a man He placed the entire human race in Himself, uniting humanity and divinity, thus redeeming us on the cross. Even though we still have a sinful nature, Jesus has covered us and will make this corruption, incorruptible at His coming. Since Christ has already died for the sins of the world, being the second Adam (Romans 5:18,19), the judgment can only be based upon what we have done with Jesus (see the parable of the sheep and goats in Matt 25). Those who reject Christ will not receive zoe life and thus having only bios will not survive the glory of God. The soul that sins shall die. Only God has immortality (1 Tim 6:16), thus only those who are in Christ can be alive forever (Romans 6). Might I suggest a study on the subject of fire in relation to the presence of God & Holy Spirit. Also the story to the 3 Hebrews who were brought through the fire because God was with them, not separated. Amen! I will take your advice on studying the subject of fire as well. It is one that I have not looked at thoroughly enough. Thanks Rich, I have saved the link and will read it today. Yip I remember this one, I'm going to read it again today though. I try to read a lot of pro ECT and anti CI material as well, I have even read a few books on universalism. It's not that I am unaware of the arguments, I'm simply more persuaded that evidence points away from ECT and UR. The penalty of sin is death. Jesus mention that hell has been made for the devil and his demons but many humans are going there also. Talking about death (Gods view), Adam died after disobeying God, yet his body was living in despair. Death doesnt mean to disapear, yes they will be separated from God has scriptures says... for how long? I dont know. God's plan is bigger than my brain, and his word are written. Hell for the loser... not disappearance, but a place where he will enjoy being stubborn. I accidently read your article. The message we have been told to proclaim is the Kingdom of God... Dont waste your time understanding a place where you do not belong, unless you want to try it. From experience, I can assure you that death is the knowledge of knowing that you are done, you don't have the chance to know love. In answer to : "The purpose for resurrecting those outside of Christ only to have them suffer a second death is still a mystery to me but there must be a purpose behind it that I am yet to understand." the sin issue began in heaven with Lucifer accusing God of not being just, not allowing freedom. Whenever there is an acted person and an accuser there must be an uninvolved witness to decide the case, whether true or false. The whole universe is looking on. What God does by resurrecting the unsaved is then complete the testimony of every person living on earth, the wicked and the righteous. For after the righteous are resurrected, they enter into judgment of "men and of angels." 'when that is over they are resurrected for the universe to see the end of all sin and sinners and Satan and evil angels. It completes the record for all to see through all eternity. This is why sin will not rise a second time. There is a holy record of the whole heavenly and earthly sin experiment, both humans and angels involved in this controversy over God's goodness, concerning God's fairness and sacrificial love, and the results of turning from God and His loving authority. Otherwise, God would simply just leave them dead. Thanks, Ryan. I came to these conclusions also. It's a tough one though because, the church really likes its version of hell. One thing that plagued me was that JW's believe this also, but I guess even a blind squirrel finds a nut every now and then. I used to ponder that verse which said every tear will be wiped away, and I couldn't see how that could be true if others were suffering torment forever. I started thinking about the character of God and really looking at the kind of things you pointed out. The Bible says that those who do not make it have to go into ever lasting fire, prepared for the devil and his angels. This means that whatever happens to the devil also happens to those that do not make it. As you can see in Ezekiel 28:18 the devil is turned to ashes from the inside out. Anything that is turned to ashes no longer exists. It is the punishment that is everlasting, not the way that the punishment is carried out. It is my opinion that 'everlasting fire' likely means everlasting judgment. The devil is called "the son of perdition". The son of perdition is the only named son of GOD that is currently sentenced to death. Perdition means to perish. If something perishes, it is gone, it is dead. If something is turned to ashes, it is destroyed. It is no more. I don't think that GOD would allow someone to suffer forever. Also, take a look at this verse: Mat 10:28 And fear not them which kill the body, but are not able to kill the soul: but rather fear him which is able to destroy both soul and body in hell. The key thought here is 'destroy'. The author of this article obviously is either ignorant of the Scriptures or chooses to ignore the ones they just do not want to believe in. The Bible has a plethora of Scripture to prove that hell is real, that Jesus created it for the devil and his angels and it is a place of eternal punishment. Sad how the devil has convinced people hell does not exist... or it is not a place of eternal punishment. Maybe he has convinced himself he will not be going there. Matthew 25 shows the Judgment of God separating the goats (those who are stubborn and do not know the Shepherd's voice [see also John 10]) .. Verse 41 and 46, state, “depart from Me, accursed ones, into the eternal fire which has been prepared for the devil and his angels… “And these will go away into eternal punishment…” Matthew 25:41,46. To say hell is not everlasting is ignoring what Jesus said it is. Luke 16 shows the fate of the Rich man and the bliss of the beggar, Lazarus. 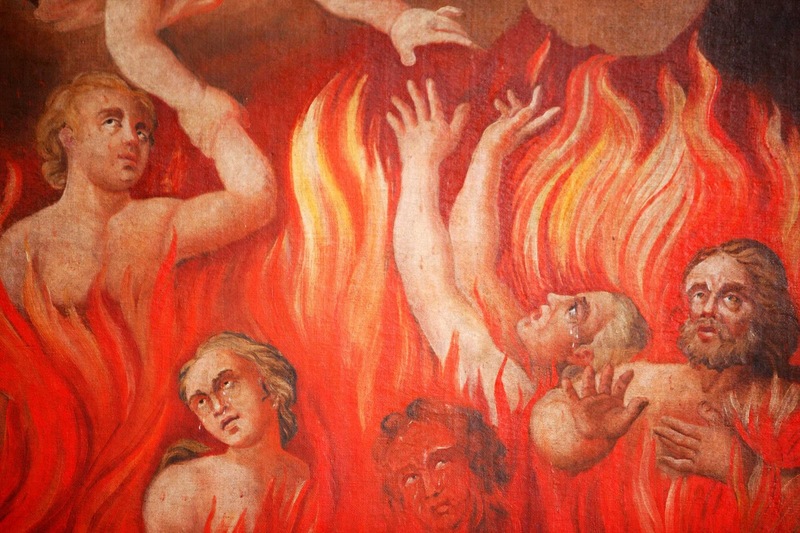 There is so much in the Bible to show Hell is real and it is a place of everlasting torment. God does not send anyone there, they send themselves there. Hi Matthew, I'm not sure if you read the follow-up article linked at the bottom of the post? I reaffirmed my belief in the eternal consequences of sin and I also addressed both of those passages you propose that I choose to ignore. Well Wes. You may have just done me a service. I kept scowling at the topic but the Holy Spirit didn't want me to close the tab. I will look into this some more. Thanks. I accidentally deleted my original reply. I just wanted to say thanks for being willing to at least check it out. Please let me know your conclusions regardless of what they might be. i am going thru your list of "doctrines of annihilationism" from your "over here" link and am finding obadiah very interesting. i thought i had nothing new to learn from that book. thanks. also, the tree of life aspect is very interesting. i have done an extensive study on that tree but never connected the dots with actual eternal life on the other side of abraham's bosom. very nice. yeah this whole thing is mind blowing to me. not that it really matters to me what will become of those who deny the grace and power of YHVH's salvation... but just hermeneutically. i think that finding out those who take the mark and the man of sin and the beast and the false prophet were really the only people to burn forever has been epic for my mind. I'm glad that you are finding your study fruitful. The tree of life and the whole of Psalm 37 are the OT parts that I find most intriguing.Your original post touched on something important, I think our initial reactions are oftentimes one of shock and immediate dismissal but if more people were listening to the Spirit and prepared to listen to one another, I think we would learn a lot more in a lot of different areas. Keep well.